This page gathers a selection of maps from Diego Puga's academic articles and book chapters. High-quality PDF versions of these maps are available by clicking on the images. 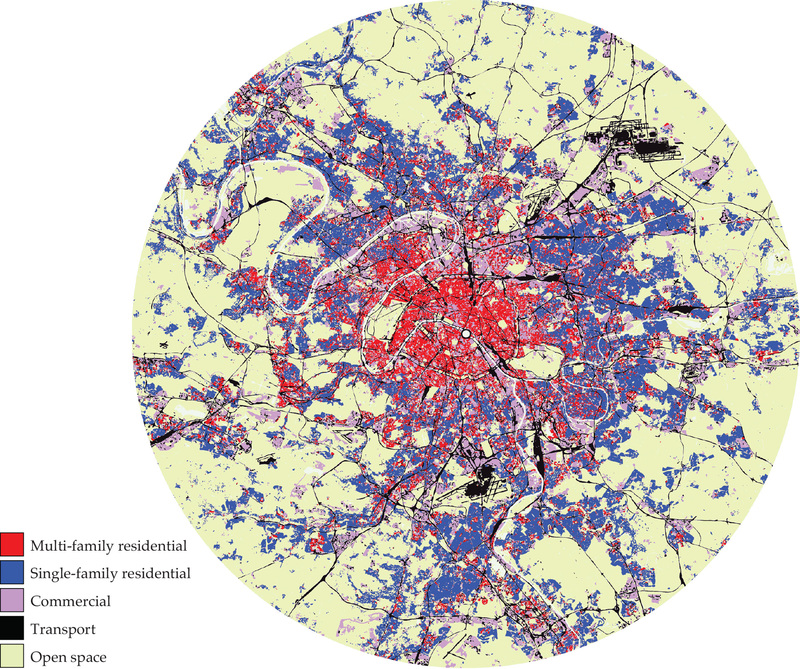 This map depicts the distribution of land across five uses (multi-family residential, single-family residential, commercial, transport, and open space) on a disc with radius 30 kilometres centred on Notre-Dame, the conventional centre of Paris. It corresponds to figure 8.1 of the handbook chapter by Gilles Duranton and Diego Puga 'Urban land use', published in Gilles Duranton, J. Vernon Henderson, and William S. Strange (eds.) Handbook of Regional and Urban Economics, Vol. 5, 2015. Amsterdam: North-Holland, 467-560. It is constructed based on the dataset Mode d'occupation du sol 2012 from l'Institut d'aménagement et d'urbanisme de la Région d'Île-de-France. 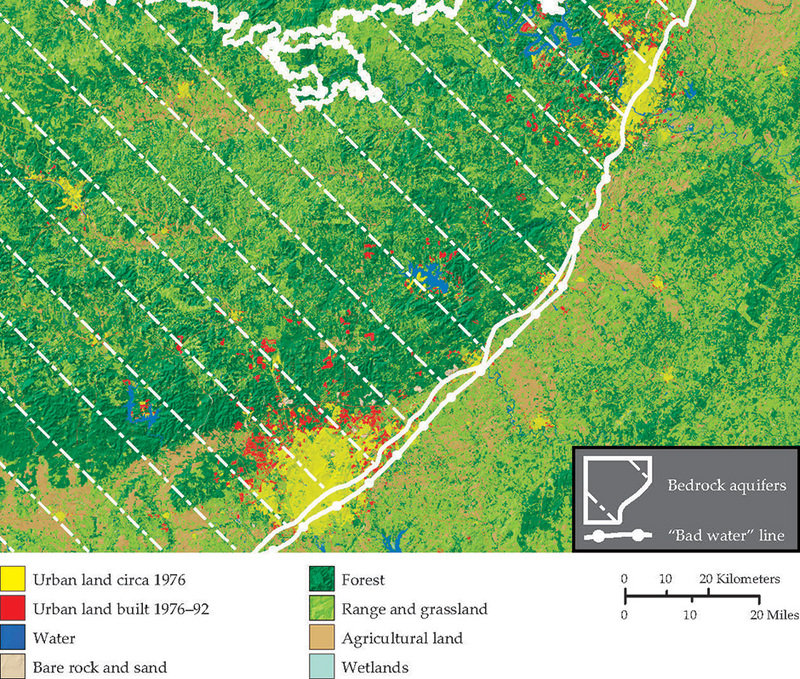 We can immediately see that patterns of land use that appear in the map are quite complex. The two plots below the map summarise the information by classifying land use by distance from Notre-Dame, with the northern half of the map plotted on the positive side of the horizontal axis and the southern half plotted on the negative side. 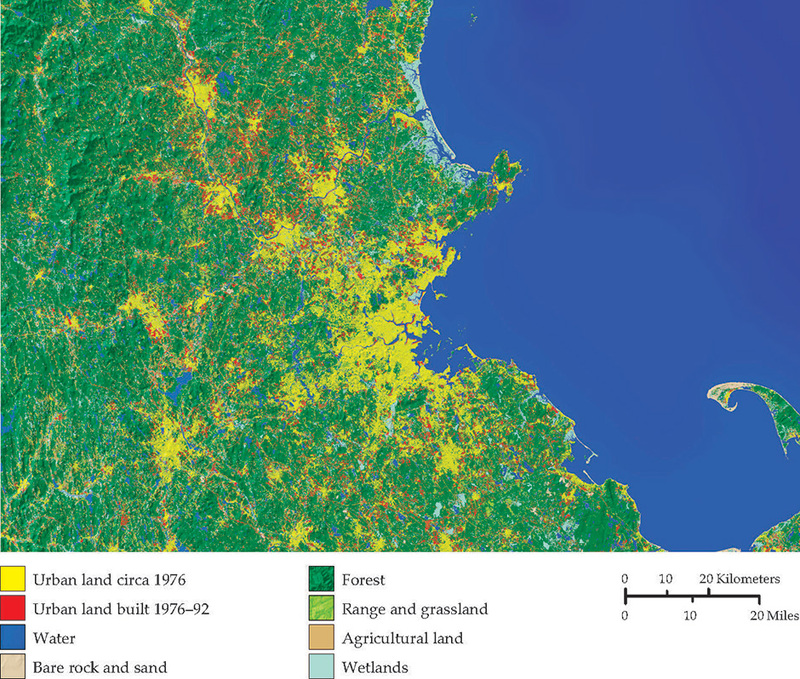 The plot on the bottom left splits all land between open space, land used for transport infrastructure, and built-up land. 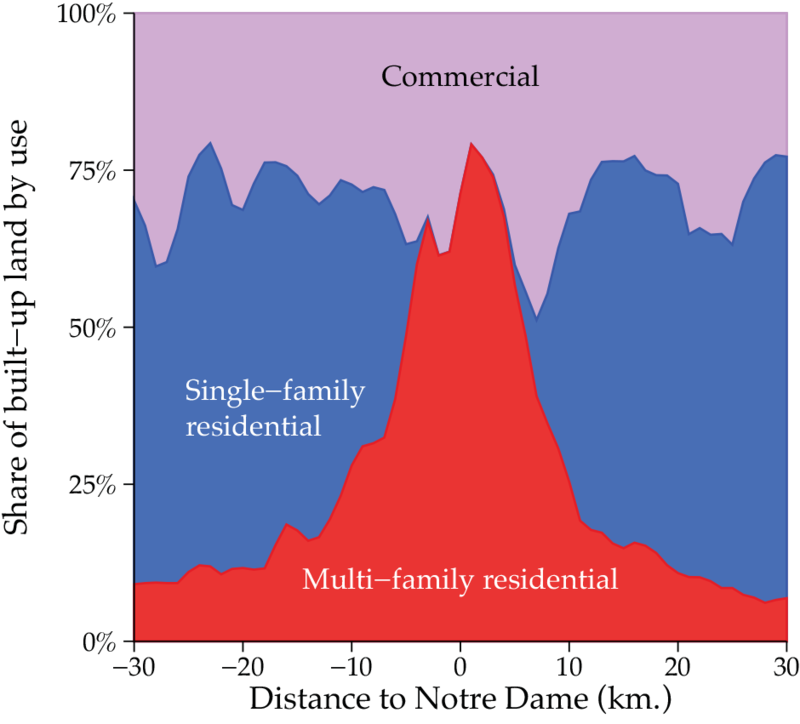 The plot on the bottom right further divides the built-up land category between multi-family residential, single-family residential, and commercial uses. Both plots show some very clear gradients. In particular, as we look further away from the centre (Notre-Dame) the percentage of land that is built up falls, with more land being open space instead. The intensity of residential development also falls very clearly with distance to the centre, with multi-family buildings giving way quickly to single-family homes. The distribution of built-up land between residential and commercial uses does not show much variation by comparison, but we do see two peaks of commercial land (pointing downwards, since commercial is plotted at the top) at the sides of a central area with more mixed use. This is reminiscent of the equilibrium land use patterns in the model of Ogawa and Fujita (1980). 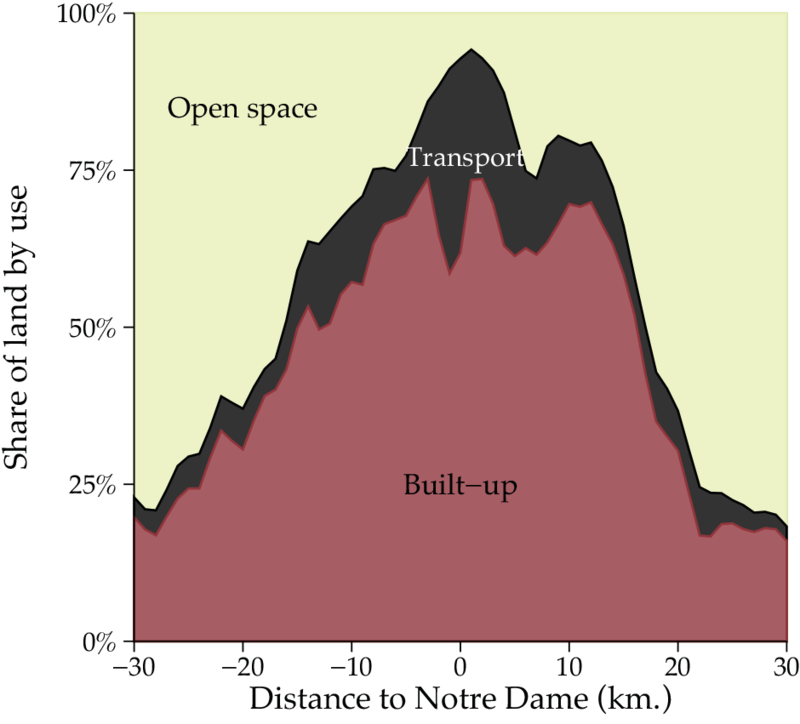 It is also worth noting how much space is taken up by transport infrastructure, particularly close to the centre, a very graphic illustration of how closely tied transport is to land use issues in cities. The handbook chapter tries helping to understand both the complexity and the order that appear in these map and plots. 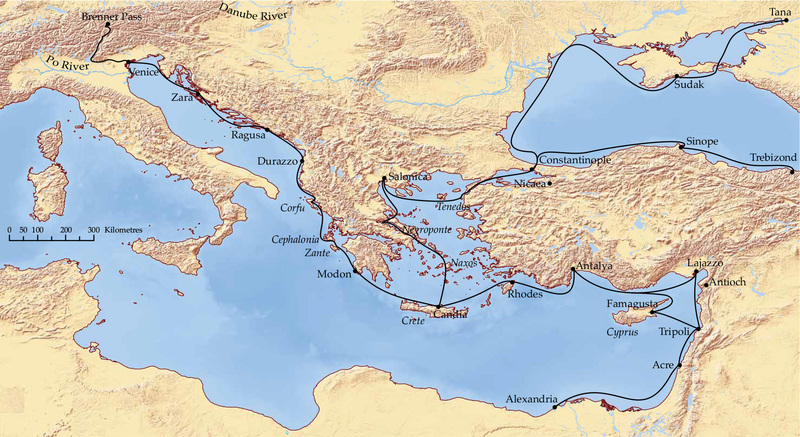 This maps shows the main eastern Mediterranean trade routes that connected Venice with Constantinople and the Levant in the Middle Ages. This corresponds to figure I of the article 'International trade and institutional change: Medieval Venice's response to globalization', published in Quarterly Journal of Economics 129(2), May 2014: 753-821.
International trade can have profound effects on domestic institutions. The article examines this proposition in the context of medieval Venice circa 800-1600. Early on, the growth of long-distance trade enriched a broad group of merchants who used their newfound economic muscle to push for constraints on the executive i.e., for the end of a de facto hereditary Doge in 1032 and for the establishment of a parliament in 1172. The merchants also pushed for remarkably modern innovations in contracting institutions that facilitated longdistance trade e.g., the colleganza. However, starting in 1297, a small group of particularly wealthy merchants blocked political and economic competition: they made parliamentary participation hereditary and erected barriers to participation in the most lucrative aspects of long-distance trade. Over the next century this led to a fundamental societal shift away from political openness, economic competition and social mobility and towards political closure, extreme inequality and social stratification. The article documents this 'oligarchization' using a unique database on the names of 8,176 parliamentarians and their families' use of the colleganza in the periods immediately before and after 1297. 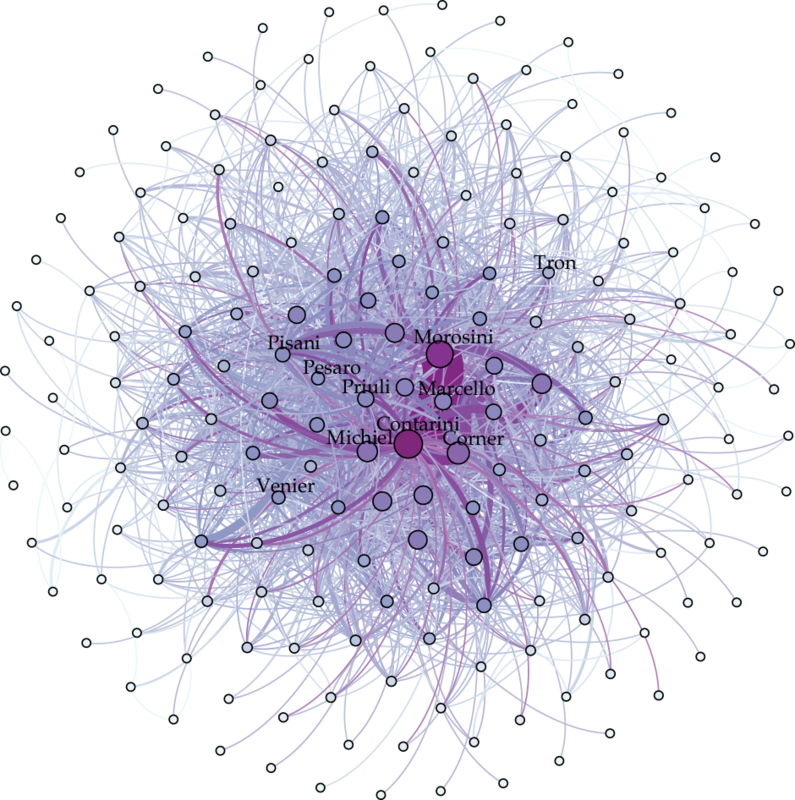 We then link these families to 6,971 marriage alliances during 1400-1599 (shown as network connections to the right of this text) in order to document the rise of extreme inequality, with those who were powerful before 1297 emerging as the undisputed economic winners. This map was prepared for academic seminar presentations of the article by Nathan Nunn and Diego Puga 'Ruggedness: The blessing of bad geography in Africa', published in the Review of Economics and Statistics 94(1), February 2012: 20-36. The analysis focuses on the historic interaction between ruggedness and Africa's slave trades. Rugged terrain is tough to farm, costly to traverse, and often inhospitable to live in; yet in Africa, countries with a rugged landscape tend to perform better than flatter ones. This article uncovers this paradox and explains it by reaching back more than two centuries. In Africa, between 1400 and 1900, four simultaneous slave trades led to the forced migration of over 18 million people, with many more dying in the process (Africa's total population was roughly stable over this period at 50–70 million). 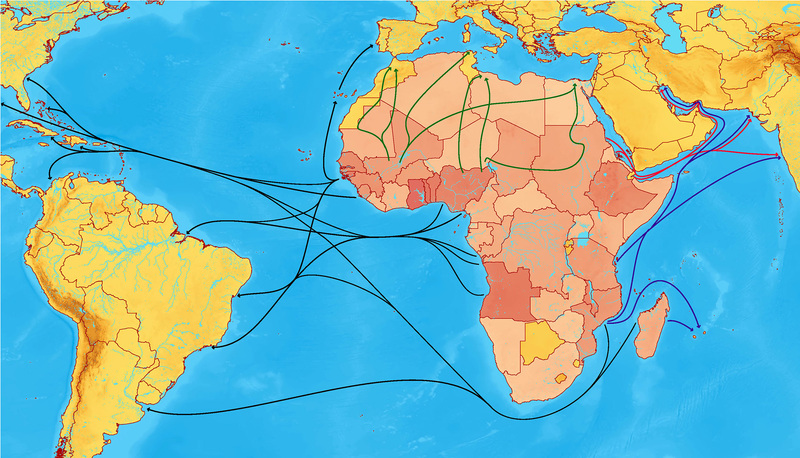 The arrows in the map depict the approximate routes followed by these four trades: across the Atlantic (in black), the Sahara Desert (green), the Red Sea (red) and the Indian Ocean (blue). African countries are shaded using present borders, with darker tones representing greater slave exports. These exports are calculated by Nunn (2008) by combining historical shipping records with slave inventories reporting slave ethnicities. The economies left behind by the slave trades were devastated: political institutions collapsed, and societies fragmented. For African people fleeing the slave trade, rugged terrain was a positive advantage. Enslavement generally took place through raids by one group on another, and hills, caves and cliff walls provided lookout posts and hiding places for those trying to escape. Today, the same geographical ruggedness is an economic handicap. However, since the slave trades retarded subsequent economic development, within Africa ruggedness has also had a historic indirect positive effect on income, which dominates the direct negative effect. We show that this differential effect of ruggedness is found in Africa only, it cannot be explained by Africa's unique geographic environment, and it is fully accounted for by Africa's the slave trades. On the whole, the results provides an example of the importance of geography through historic channels. These maps show urban development across the conterminous United States and in several metropolitan areas between 1976 and 1992. 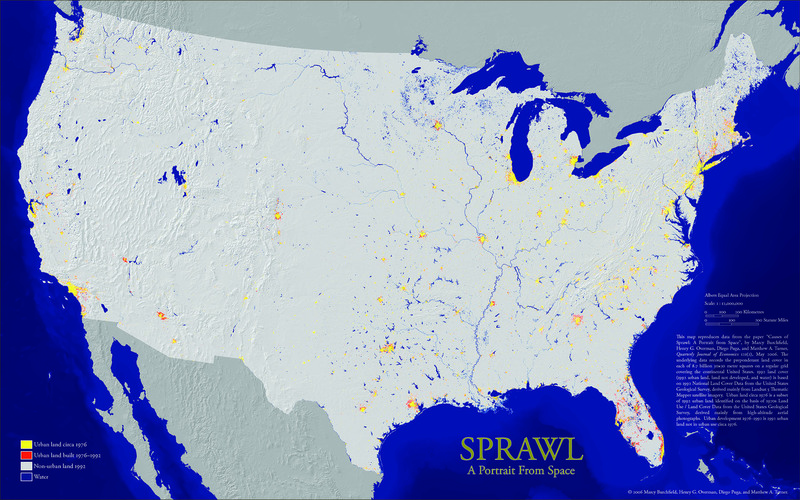 The maps are adapted from those in the article by Marcy Burchfield, Henry G. Overman, Diego Puga, and Matthew A. Turner 'Causes of sprawl: A portrait from space', published in the Quarterly Journal of Economics 121(2), May 2006. 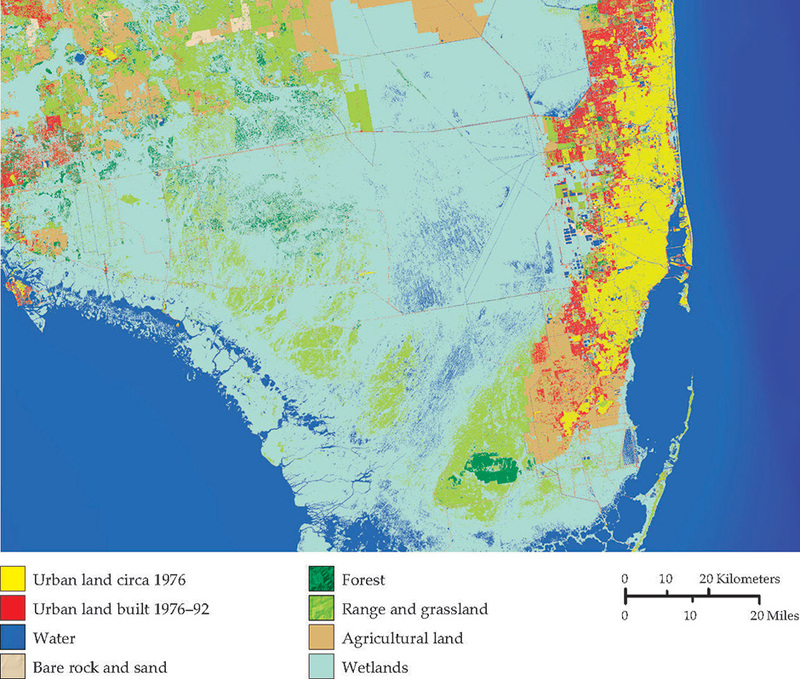 The underlying data records the preponderant land cover in each of 8.7 billion 30×30 metre squares on a regular grid covering the continental United States. 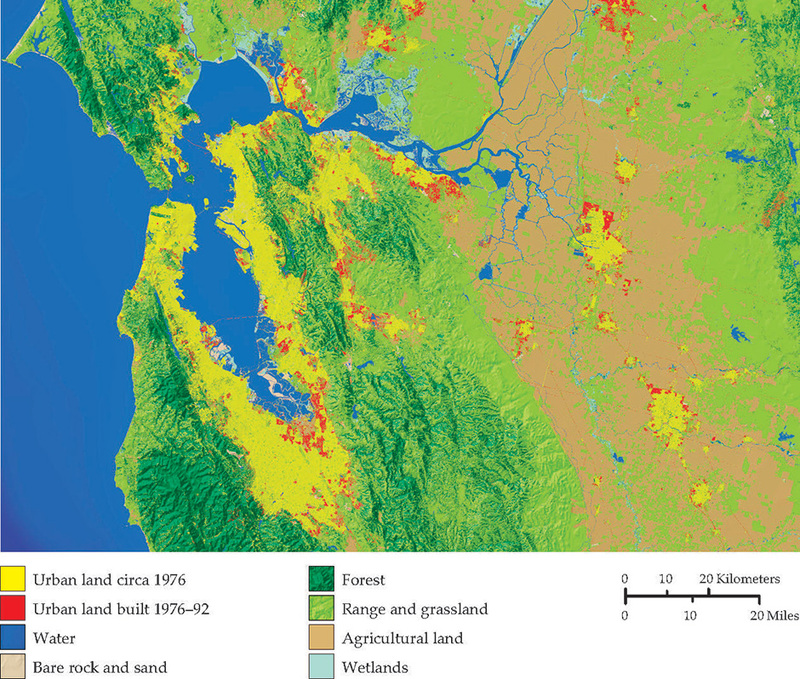 1992 land cover is based on 1992 National Land Cover Data from the United States Geological Survey, derived mainly from Landsat 5 Thematic Mapper satellite imagery. 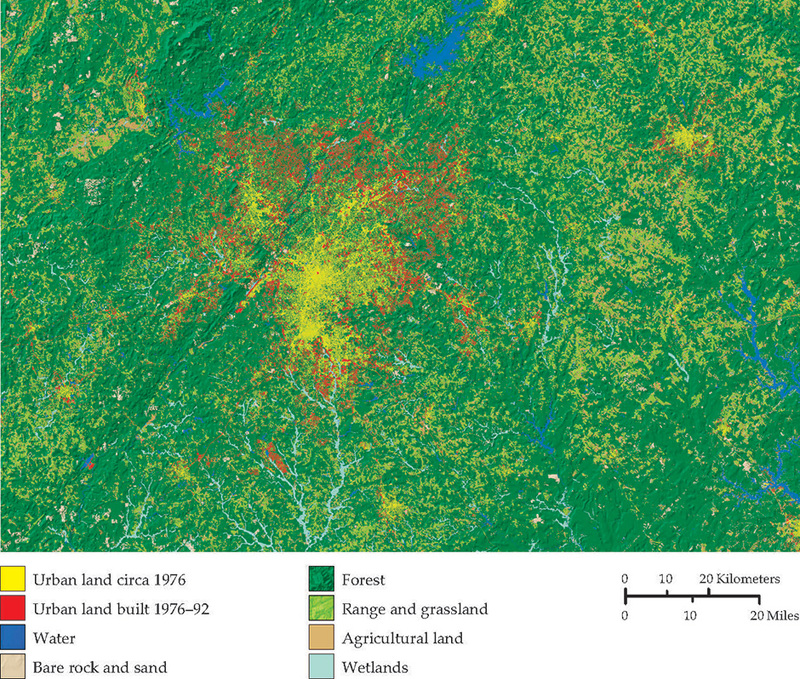 Urban land circa 1976 is a subset of 1992 urban land identified on the basis of 1970s Land Use / Land Cover Data from the United States Geological Survey, derived mainly from high-altitude aerial photographs. Urban development 1976–1992 is 1992 urban land not in urban use circa 1976. In addition to urban development patterns in Austin and San Antonio, this map illustrates that areas overlaying an aquifer, where it is possible to obtain drinking water by sinking a well, tend to see more scattered development than areas where drinking water necessarily comes from a connection to a public water system. 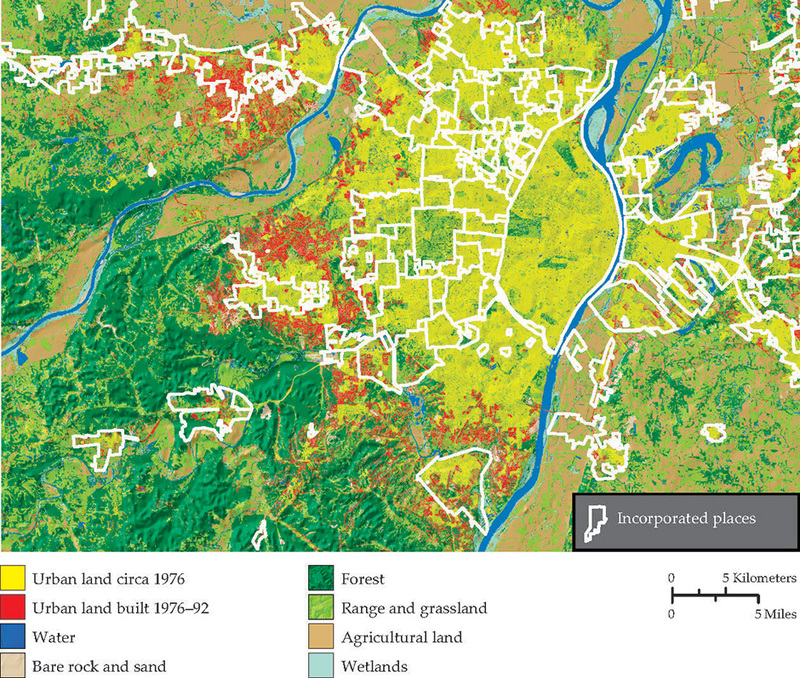 In addition to urban development patterns in Saint Louis, this map illustrates that scattered development often escapes municipal regulations by locating close to existing development but just outside municipal boundaries. This maps shows the evolution of European regional unemployment rates between 1986 and 1996. The maps are adapted from those in the article by Henry G. Overman and Diego Puga 'Unemployment clusters across Europe's regions and countries', published in Economic Policy 34, April 2002: 115-147. Starting in the mid 1980s, European regions with high or low initial unemployment rates saw little change, while regions with intermediate unemployment rates moved towards extreme values. Comparing the maps for 1986 and 1996, we can see that during this polarization nearby regions tended to share similar outcomes. Even after controlling for national and regional characteristics, there is still a strong similarity in the unemployment outcomes of neighbouring regions. Most surprisingly, this geographical component is as strong within as across national borders. As a result, national borders became increasingly blurred. The analysis in the article suggests that the polarisation of regional unemployment rates was the result of a spatial reorganisation of employment over this decade of deepening European integration, with clusters of rising or falling employment extending across neighbouring regions and even across neighbouring countries. Gilles Duranton and Diego Puga. 2015. Urban land use. In Gilles Duranton, J. Vernon Henderson, and William S. Strange (eds.) Handbook of Regional and Urban Economics, Vol. 5, 2015. Amsterdam: North-Holland, 467-560. Nunn, Nathan. 2008. The long term effects of Africa's slave trades. Quarterly Journal of Economics 123(1): 139-176. Nunn, Nathan and Diego Puga. 2012. Ruggedness: The blessing of bad geography in Africa. Review of Economics and Statistics 94(1): 20-36. Ogawa, Hideaki and Masahisa Fujita. 1980. Equilibrium land use patterns in a nonmonocentric city. Journal of Regional Science 20(4): 455-475.